Chocolate cake. Chocolate icing. Chopped pecans. The terrific trio is at it again—this time in potluck-perfect squares that will win rave reviews. Preheat oven to 375°F. Place water, 1/2 cup (1 stick) of the butter and 1-1/2 oz. of the chocolate in large saucepan. Bring to boil, stirring occasionally. Remove from heat. Stir in combined flour and granulated sugar. Add eggs, sour cream, baking soda and salt; mix well. Pour into greased and floured 15x10x1-inch baking pan. Bake 20 to 25 minutes or until toothpick inserted in center comes out clean. Place remaining 1/2 cup (1 stick) margarine, remaining 1-1/2 oz. chocolate and milk in large saucepan; bring to boil. Remove from heat. Gradually add powdered sugar, beating until well blended after each addition. Mix in vanilla. 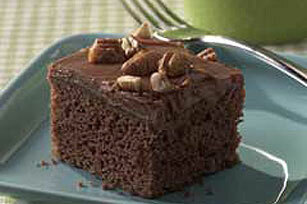 Spread onto warm cake; sprinkle with pecans. Cool completely. Cut into 48 squares to serve. Substitute miniature semi-sweet chocolate chips for the pecans. Makes 48 servings, 1 square each.